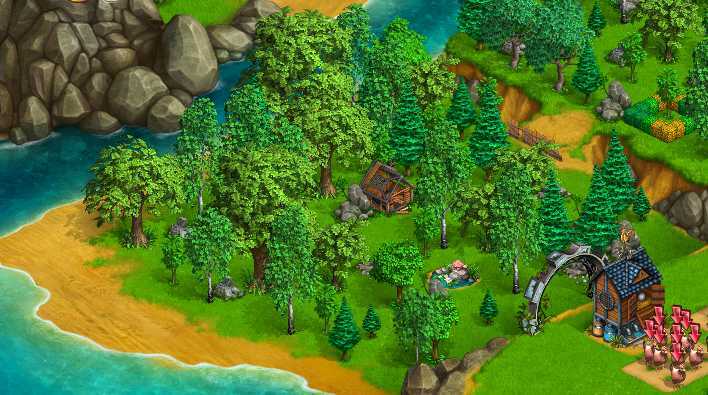 As in the case of many other Facebook games you can expand at various stages in the game to get more land and extra features. There are currently 10? expansion areas. There's a question mark here because I'm only able to use six of them. You'll get this expansion around level 20 but you won't get it until you've completed the mission 'Stock' - Get 3,000 wood and $5,000. Once you have bought the expansion (for $25,000!) you will need to repair the bridge to use it. That will cost you a further 1,500 wood and $1,500, 5 amber paint, 15 boards, 15 metal and 10 bolts. 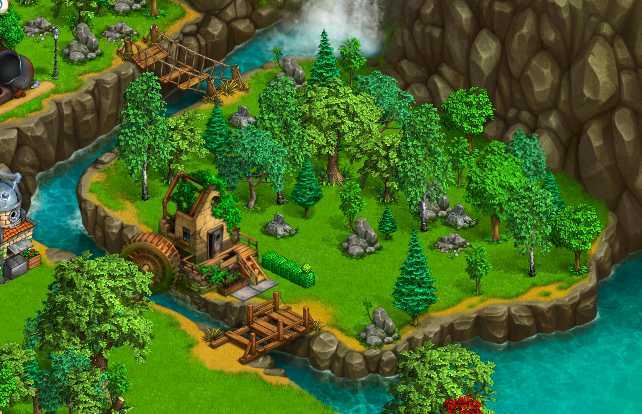 Repairing the bridge gives you access to your new land on which you can see a ruined watermill. You'll need to repair this mill - another 1,480 wood, $8,000, 160 food, 75 resin, 15 yellow paint, 95 phosphor and 20 wood blocks. 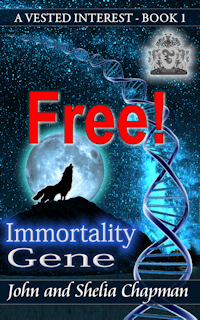 The mill will then start working for you earning you 1 ash and XP every 24 hours. Incidentally the mill is the only building which can't be moved on your map. Move all your buildings to this new area. This gives you maximum space in the entrance area for animals and crops and helps visitors find things to do quickly. You don't have to have chicken houses next to chickens! You'll get this expansion around level 22 but you won't get it until you've completed the missions 'A very important step' - You have to go courting! Once you have bought the expansion (for $35,000!) you will need to repair the 'Old farmer bridge' to use it. That will cost you a further 10 steps of $1,000, 150 wood and 20 food. To complete it you'll need 30 glue, 20 boards, 20 wood blocks and 30 bolts. 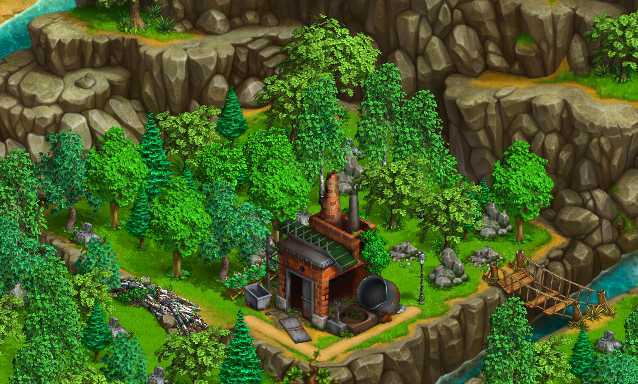 Repairing the suspension bridge gives you access to your new land on which you can see a ruined blast furnace. You'll need to repair this - another 15 steps of $1,250 and 150 wood. To complete it you'll need 30 bolts, 10 hypnos, 50 metal and 100 amber. The blast furnace will then start working for you earning you 1 aluminium every 24 hours. Note to developers - You can't make aluminium in a blast furnace! It's made by electrolysis in a smelter. Blast furnaces are used to make iron, zinc and less reactive metals. You can move the blast furnace if you wish. Put it somewhere where it's reward does not fall over water so that the cat can collect it. You'll get this expansion around level 32 but you won't get it until you've completed the missions 'New territory 1 to 4' - Oh and you'll have to get married! Once you have bought the expansion (for $75,000), there's a barrier in the way which you will have to clear with dynamite. You'll need 50 ash, 50 phosphor, 40 metal and 15 sticks of dynamite. You'll get a little extra space, trees and rocks to clear. No buildings this time. 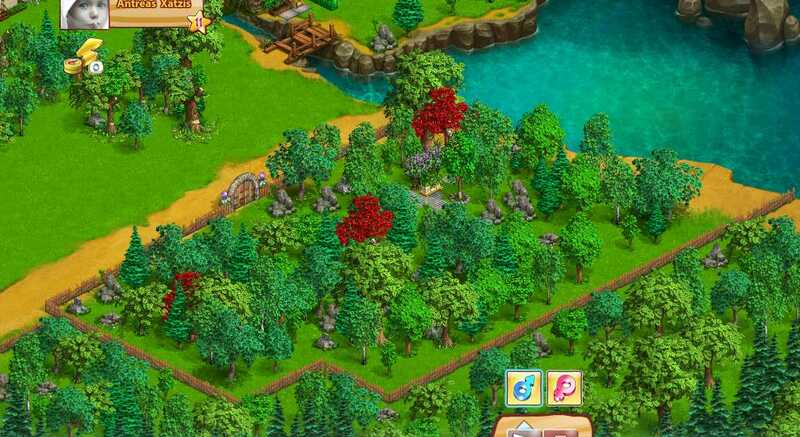 It takes a long time for visitors to get to this area so it's not a good idea to put crops or animals there for now. Move the buildings here. Later you'll move them back to the back corner. You'll get this expansion around level 35 but you won't get it until you've completed the missions 'Land sale 1 to 3' and befriended the dog by feeding it meat. Once you have bought the expansion (for $165,000), there's a dog kennel/doghouse and a teleport which you'll have to repair. To repair the dog kennel you'll need 10 steps of $1,150 and 175 wood. To complete it you'll need 20 boards, 20 wood blocks, 25 bolts and 20 orange paint. Once you've fed the dog again, with 10 meat this time, he will give you an extra help action on neighbor's farms (now 6) and reduce the power needed to scare off monsters. To repair the teleport You'll need 15 steps of $1,250 and 100 wood. To finish it you'll need 50 metal, 25 radium, 35 aluminium and 40 motors. Once complete it will allow quicker access to expansions 2, 3 and 4. With the teleport repaired, move your buildings back to the back corner. This speeds things up when neighbors visit. You'll get this expansion around level 44 but you won't get it until you've completed the missions 'Abandoned Expanses 1 to 5' and bought the expansion (for $450,000), there's a fence surrounding this area which you'll have to remove. 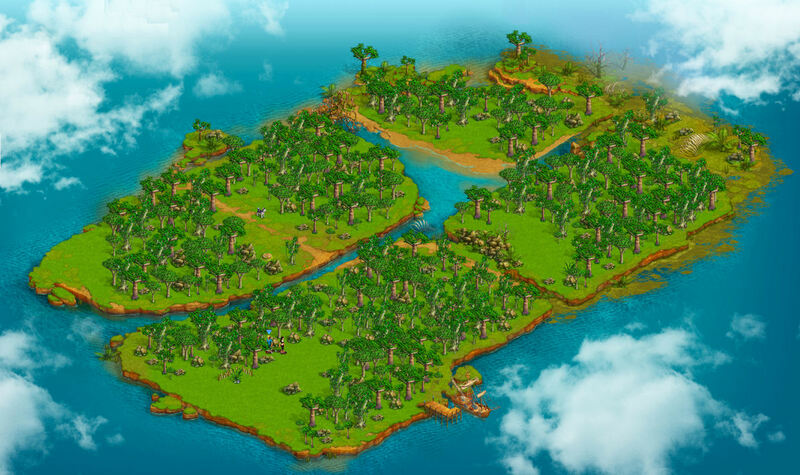 This is quite a large area and is great for crops and animals. Many visitors won't be aware of it or see it. Keep this in mind. Beware also of rewards which fall on or outside the fence - the cat won't pick these up. You'll get this expansion around level 50. There appear to be at least 4 expansion sections. You have to completed the missions 'Out of debris 1 to 11' and 'Moving out 1 - 6'. These missions include repairing the ship at the entrance. This needs 10 steps of 100 wood and 10 wood blocks, 10 boards, 15 bolts and 10 barrels of fuel oil which you get as rewards during the Out of debris missions. The dog and cat go with you when you visit the island. At first the lab button will not work - you need to build a new one there. Once you've completed 'Out of debris 11' you can use the ship and get to the island. 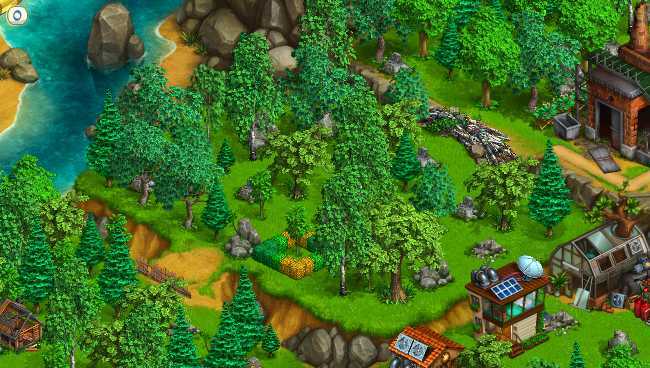 You can't build the house you need until mission Lost island 2 or the prehistoric lab you need until the Lost island 4 mission.